This beautiful piece of religious jewelry features four natural Baltic amber stones. The stones are a deep honey color and feature their own unique set of natural inclusions. Natural inclusions are small bits of organic matter which have been trapped inside of the amber stone since it first formed. The inclusions include tree-bark, and other plant-life. 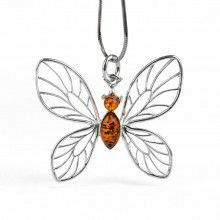 The inclusions give each piece of amber its own character, and charm. They also greatly enhance the beauty of the amber stones. The stones measure 1/4" in length by 3/8" in width. The stones are complimented by the genuine .925 sterling silver cross which they are set it, as well as a sterling silver bail. The pendant itself has a length of 1 7/8" and a width of 1 3/16". This would make a great gift, or a great way to display your own faith. Pendant Measures: 1 7/8" x 1 3/16"
Honey Amber Stones Measure: 1/4" x 3/8"